Do I Have The Colon Health To Avoid Disease? Published Nov 13, 2018 By Salvatore Crapanzano C.C.Ir., B.A.Sc., M.A.Sc. Today I'm going to write about colon health, how you know you have it, and what supplements and bathroom devices can actually work to stay healthy. You might be surprised about what is true and what is not! What Is Adequate Colon Health? Dr. Normal Walker wrote the book on Colon Health and sounded the alarm on this forgotten body-part. Today most people have to worry about their colon health more than ever before. Making sure the colon is working perfectly and you are eating for colon health is worth it, because you can avoid pain, and serious diseases such as diverticulitis. To have optimal colon health, you must be able to listen to your colon, and have at least 2-3 good size bowel movements per day. A poorly functioning colon will result in poor sleep especially when you eat the wrong foods. And inflammation as well. Poorer colon function means reduced regularity. But it also means strained, dry and difficult to pass bowel movements. Here I will go briefly into foods bad for the colon. There are certain foods you need to avoid for colon health. The colon does not run on fibre alone. Your Colon hates it when you eat foods that require water to reconstitute them. If you eat a snack, even a healthy snack that is flat like a cracker, and even multi-grain, gluten free (such as brown rice based), you are going to hurt your colon. In fact if you eat crackers in a soup, that will be less likely to hurt than eating raw real crackers just out of the box for a snack. Because they will be softened up. But then there is the mineral loss to understand because of White Flour Products (i.e. the crackers). This poor food choice can cause stress on your body, because your Adrenals need to be used to keep the minerals in homeostasis. There is no "natural" food that mother nature made with rough edges like any kind of potato chip, corn chips, tacos, nachos, crisps, or crackers, thins etc. An example of the opposite of any of these foods would be avocados or kiwifruit. Nourishing to you and moisturizing to the bowels. Think about it this way: you are providing a time release of moisture/water to the bowels by eating these foods. And the result is an easy bowel movement. However, there are still foods which are supposed to be good for you, but are not good for the colon. Rye bread, and rye crisps also steal moisture from the colon, and no amount of fiber can fix that, because colon health requires adequate water intake. Ok, now for the really bad news for Pizza Lovers. Ok, Pizza is bad for the colon too! You want the truth right? All that happens is you end up slowly stealing energy from your colon, and over time, your guess is as good as mine as to what dis-ease can occur. You can also steal minerals as well, like I said above. But there is no doubt in my mind that you are more likely to get some kind of disease. Medicine may not know it, but I do. You might ask, what about dried "healthy" snack foods, like dried banana chips, dried apricots, dried whatever chips. Well, the harder these foods are the worse it is for you colon. Same difficulty, robbing your colon of moisture. To learn more about how to keep your colon healthy, and the complete details about good and bad foods. I'm sure you have heard of Colon Cleansing, but what about Tonifying the Colon? It basically means to give strength to the Colon because your colon muscles are weak, and not strong enough to evacuate easily and properly. While it is tempting to cleanse the colon with popular colon cleanses, most people have probably not really supported the muscular movement of the colon by tonifying the colon. The term "tonify the colon" is commonly used by TCM practitioners, and also herbalists to indicate a weakness needing fixing. So, you have a weak colon, or sluggish colon. Maybe it does not give you that strong urge to go poop it once did. What solves this problem is taking a supplement on a regular basis which is not a laxative, but a tonifier. It works very slowly, but you can take larger doses of it to get your colon health back faster. Having good colon tone means you evacuate properly and you will be disease free later in life. Constipation is not just because of a lack of fibre, but because of a lack of muscle tone and weak urges. Sometimes it is also because you tell your body when to have a bowel movement rather than listen to it. 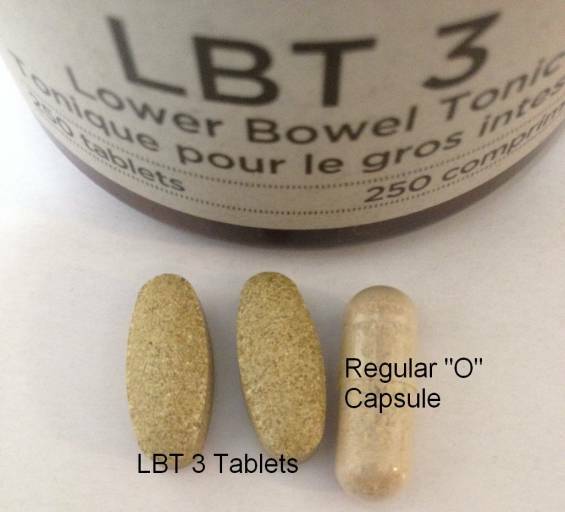 Watch Dr. Terry Willard, a Master Herbalist with over 30 years experience speak about this 30 year old herbal product called LBT3 (Lower Bowel Tonic 3) on You Tube. As always the advice here is not to be taken as medical advice. Seek medical care from a qualified medical doctor to rule out serious bowel disease. LBT 3 stands for 3rd generation Lower Bowel Tonic #3. It helps restore the peristaltic action of the colon. This formula can take several months to fully restore function depending on your age, but will likely start showing results after 1 month of continuous work. This product is only available to be shipped from Canada. Wild Rose is a Canadian herbal products company. Please see the picture below of the LBT 3 tablets. These LBT 3 herbs are pressed into a tablet, but it is all herbs and no coating. It is slightly smaller than a regular "0" capsule. Because they are not as smooth all over as a capsule I ingest each tablet by turning it right, and with a good amount of water. It can take a little while to get used to ingesting them. But they will certainly help in the long-term! Available in 100 and 250 tablets from National Nutrition in Canada. Note: NOT an affiliate link. An alternative product in capsule form on the market in the USA is from Blessed Herb. It is called the Digestive Stimulator®. It is a formula which contains more herbs in it. Get Info on the Digestive Stimulator. What makes both of these herbal products unique is that they are energetically balanced. That means that any long-term use will not disturb your body's warming energies further, and you won't end up with strange feelings of cold and warmth that come and go, or cold hands and feet in the winter. This is usually achieved through the warming nature of ginger in the formulas. If you have prolonged feelings of cold hands and feet in the winter, inside the house or outside, you may have an issue with Yang deficiency and need your diet looked at carefully. If you get the cold feet sensation in the winter especially at midnight usually while in bed, even just once, this ia a warning sign from the body of a Yang deficiency. This symptom should be addressed ASAP. Please note that while it is tempting to think that taking one of these herbal formulas will fix your colon, in reality it is wiser to look at other aspects of bowel health to get more quicker and complete results. Fixing your stomach acid function, and fix your Spleen in TCM to improve digestion will go a long way to to getting regular bowel movements. If you have food intolerances or food sensitivities and continue eating foods these that are wrong for you your stomach function will not be optimal. In other words your stomach acid will be reduced. There is a direct relationship between stomach acid and bile flow, and therefore an under-active stomach will cause reduced bowel movements. In essence you will not even be able to digest any herbal formula properly to improve digestion and colon function. To break the pattern you have to reboot your stomach and remove the "offending foods". Everyone has these offending foods, and when they are discovered in an Elimination diet and then removed for some time the stomach will restore its function. What other things affect bile flow to cause reduced regularity? Vitamin and mineral deficiencies and low protein intake. For example a chronic deficiency of sulfur in the body due to improper diet, or the inability of the body to uptake and store sulfur as sulfate ions will cause chronic constipation due to bile deficiency. Before you are taking the proper herbal formula for fixing your colon, you need to ensure you are getting enough minerals. If not you need to start taking a good mineral supplement. This is especially true if you have low stomach acid, and are not absorbing your nutrients properly. The colon needs minerals. Eating white flour products steals minerals from the body. This is even more important as you age when you could need more minerals such as Magnesium. And don't forget to consume the correct Natural Salt with the trace minerals, and ensure you are getting enough Iodine from either a mineral supplement or other foods. When you want to have better colon health the following inexpensive device that fits underneath the toilet seat is very important. The Squatty Potty® allows you to have better posture that is more natural to a full evacuation. It allows you to comfortably prop your legs up several inches to well ...poop better. If you are tired of straining, have strange stomach pains that wake you up at night, or are not feeling that you "pooped" out properly this is one of the things you may need. Even if you feel ok, no matter your age, you would benefit starting early. No one should be without one of these devices. Dr. Datis Kharazian, has given lectures on the Brain-Gut Axis, and mentioned two things that you can do to improve gut Health. One of those is singing, and the other is gargling at length. Both of these if done regularly will increase motility. Download the pdf transcript from the Digestive Sessions and Read More. Eating warm, hot beverages, soups in the winter helps the colon. On the other hand, drinking cold beverages (even cold spring water) and eating cold food on a regular basis will also disturb your digestion. Our digestion requires warm food. Do not drink cold, refrigerated, or iced-water, or juices, even in the summer. If you have a craving for cold water, or iced-water in the winter, you have a yin-deficiency. Time and time again I've seen clients who have colon problems exacerbated because they drink cold water. Drinking cold water which is not at room temperature will be harmful to your colon health and digestion in the long-term. If you want to learn more about how to protect your health, please join my Facebook Page. I post some important articles once or twice a week and you won't want to miss a thing! Outside of email communication, it's the best way to leave a comment about something important to you.